UNITED NATIONS, June 22 -- Propaganda is a concept usually attributed to states, but the United Nations, a club of states, engaged in it too. A recently-begun review of UN system social media activity finds waste and contradictions, often an online echo chamber in which people who are being paid to appear to be cutting edge back each other up but don't answer questions from the outside. 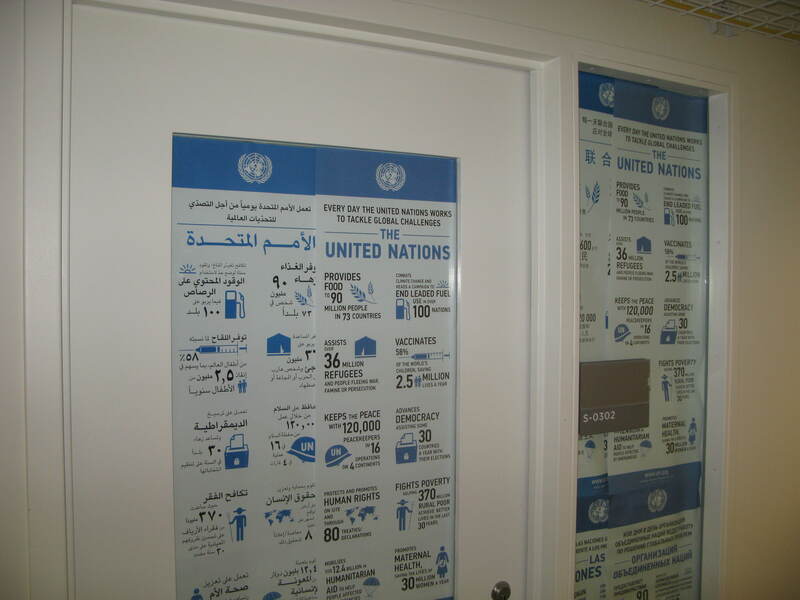 Take as one example the UN “Information Center” or UNIC in Dar Es Salaam, Tanzania -- while the whole purpose of its Twitter account is presumably to inform the public, the account is locked: you have to apply and be accepted to see what this UNIC is tweeting. Then there's the UNIC in Khartoum, which tweeted a report blaming the SPLM-North rebels for killing a UN peacekeeping, something the UN in New York has been unwilling to do despite two requests from Inner City Press. but UNIC Khartoum did not respond to a question about its tweet, from the Free UN Coalition for Access, @FUNCA_info. At headquarters, one of the UN system's “gurus” of social media, also paradoxically in charge of media accreditation, unilaterally blocked on Twitter Inner City Press, which covers the UN. Nevertheless this official contacted Inner City Press demanding an urgent explanation of a single tweet then mentioned World War Two. The official follows other members of the UN press corps, including one on the Executive Committee of UNCA, now known as the UN's Censorship Alliance who tweeted comparing Bashar al Assad of Syria to Hitler. But no inquiry was made. 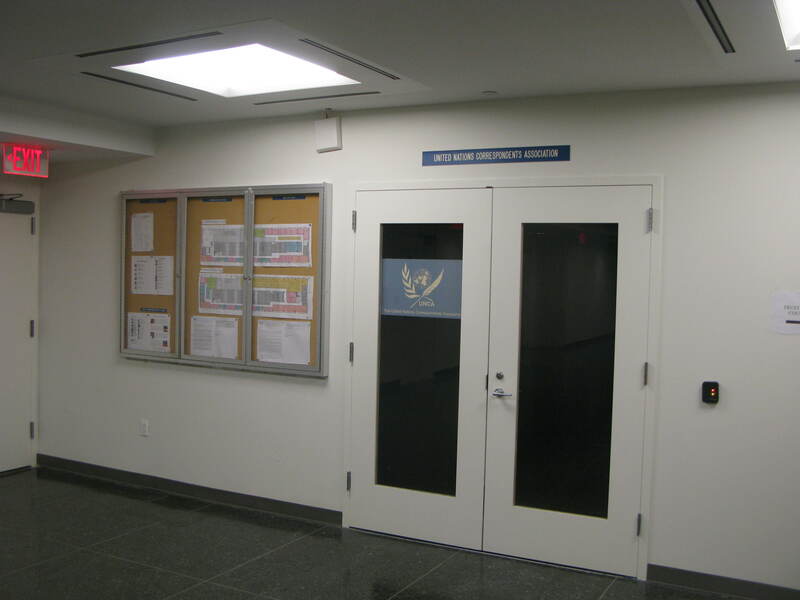 This UNCA board member has his own private office, the front door of which is festooned with pro-UN propaganda. 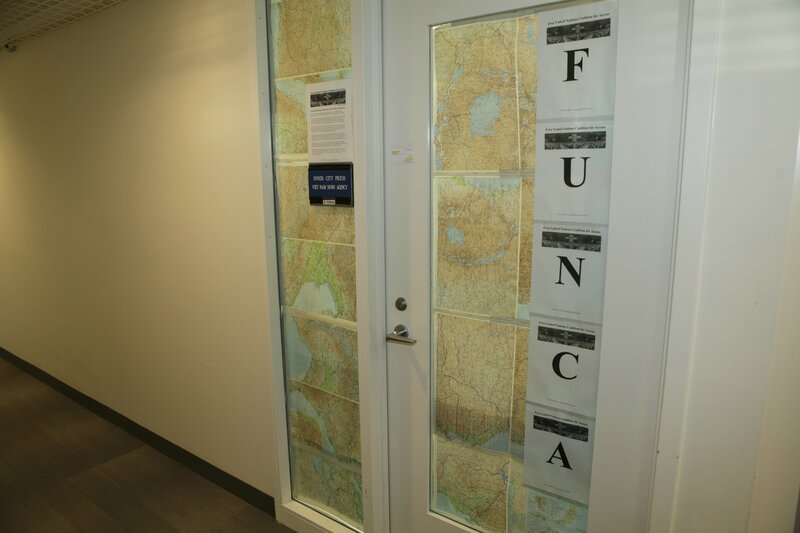 Next door, Inner City Press is under fire for having on its door a sign for the new Free UN Coalition for Access -- a rule was passed between DPI and UNCA to try to outlaw all signs but UNCA's, and on January 21 DPI sought to make Inner City Press accept three media in a two-desk office, while mere feet away the 2013 president of UNCA Pamela Falk has a private office, next to the UNCA wine cellar (and club, and office). Interestingly, this UN system social media guru who blocked Inner City Press reached out and followed FUNCA_info even in its beta phase -- but quickly when noticed, unfollowed. Were ten questions tweeted at the UN too much? Or is the UN's UNsocial media? Watch this site. Footnote: Some of the energy behind this new project was the insistent by some in DPI that past plodding forms of organization, such as that of the moribund UNCA, are the only way. FUNCA disagrees, and notes that while the UN pays more and more people to ostensibly be working in the present if not the future, the UN is stuck in the past. Blocked in the past, we might say.